The invention concerns a coupling system (white filler/diene elastomer) for a rubber composition based on diene elastomer reinforced with a white filler, formed by combining a polysulphide alkoxysilane, a zinc dithiophosphate and a guanidine derivative. The invention also concerns a rubber composition useful for making tyres, comprising at least (i) a diene elastomer (ii) a white filler as reinforcing agent, (iii) a polysulphide alkoxysilane, (iv) a zinc dithiophosphate and (v) a guanidine derivative. The invention further concerns a method for preparing said rubber composition. Finally the composition concerns a tyre or semi-finshed product in particular a running tread for tyre comprising said rubber composition. The present invention relates to diene rubber compositions reinforced by a white filler, especially for the manufacture of tires or semi-finished products for tires, especially treads for these tires. Since fuel economies and the need to protect the environment have become a priority, it is desirable to produce elastomers with good mechanical properties and as low a hysteresis as possible in order to implement them in the form of rubber compositions suitable for the manufacture of various semi-finished products used in the construction of tires, such as for example subbing layers, calendering or sidewall rubbers or treads and to obtain tires with improved properties, with particular resistance to reduced rolling. To achieve this goal many solutions have been proposed, first mainly focused on the use of elastomers modified by agents such as coupling agents, starring or functionalizing with carbon black as a reinforcing filler in order to obtain a good interaction between the modified elastomer and the carbon black. It is known, in general, that to obtain the optimum reinforcement properties conferred by a filler, it is necessary that it be present in the elastomer matrix in a final form which is both as finely divided as possible and distributed as uniformly as possible. However, such conditions can only be carried out insofar as the filler has a very good ability firstly to be incorporated into the matrix during mixing with the elastomer and to deagglomerate the other to disperse homogeneously in this matrix. So quite known that carbon black has such abilities, which is generally not true of white fillers. For reciprocal affinity reasons, white filler particles have a tendency, in the elastomer matrix, to agglomerate them. These interactions have the undesirable consequence of limiting the dispersion of the filler and hence the reinforcing properties to a level substantially lower than it would be theoretically possible to achieve if all the (white filler / elastomer) may be created during the mixing operation were in fact obtained; these interactions furthermore tend to increase the consistency of the rubber compositions and therefore to make their implementation ( "processability") in the raw state more difficult in the presence of carbon black. The interest in rubber compositions reinforced with white filler was greatly revived with the publication of the European patent application EP-A-0 501 227, which discloses a diene rubber composition sulfur curable, reinforced precipitated silica particular of highly dispersible type, which enables to manufacture a tire or a tread having a significantly improved rolling resistance without affecting the other properties, in particular those of grip, endurance and resistance to wear. EP-A 0 810 258 discloses it a new diene rubber composition reinforced by another special white filler, namely an alumina (Al2O3) of high dispersibility, which enables also obtaining tires or treads having an excellent compromise of conflicting properties. The use of these highly dispersible silicas or aluminas specific, as majority reinforcing filler or not, has reduced the difficulties of implementation of the rubber compositions containing them, but that implementation remains more difficult than for compositions rubber filled conventionally with carbon black. In particular, it is necessary to use a coupling agent, also referred to as bonding agent, which has the function of ensuring the connection between the surface of the white filler particles and the elastomer. while facilitating the dispersion of the white filler within the elastomer matrix. T represents a hydrocarbon group that links Y and X. The coupling agents must particularly not be confused with simple white filler covering agents which in known manner can comprise the Y function active vis-à-vis the white filler but are devoid of the X function active vis-à -vis the elastomer. coupling agents silica / elastomer, in particular, have been described in a large number of documents, the best known being bifunctional alkoxysilanes. Thus it has been proposed in patent application FR-A-2 094 859 use a mercaptosilane for the manufacture of tire treads. It was quickly shown, and is now well known that mercaptosilanes, particularly γ- mercaptopropyltrimethoxysilane or γ-mercaptopropyltriethoxysilane, are capable of giving excellent silica / elastomer coupling properties, but that the use industrial of these coupling agents is not possible because of the high reactivity of SH functions which very rapidly during the preparation of the rubber composition in an internal mixer in premature vulcanization, still called "toasting" ( " scorching ") at very high Mooney plasticity values, ultimately virtually impossible to rubber compositions to work and to carry out industrially. To illustrate this impossibility of using such coupling agents bearing -SH functions and the rubber compositions containing them include for example FR-A-2206330, US Pat 4,002,594. To overcome this disadvantage, it has been proposed to replace these mercaptosilanes by alkoxysilane polysulphides, including polysulfide bis-trialkoxy (C 1 -C 4) silylpropyl as described in numerous patents or patent applications (eg EN -A-2,206,330, US-A-3,842,111, US-A-3,873,489, US-A-3,978,103, US-A-3,997,581). These polysulfides are, inter alia disulfide, bis-3-triethoxysilylpropyl (abbreviated TESPD), specifically of bis-3-triethoxysilylpropyl (abbreviated to TESPT) considered today as the product which, for vulcanized rubber compositions filled with silica the best compromise in terms of scorch safety, ease of implementation and reinforcing power. We have discovered during his research that the use of a zinc dithiophosphate in small quantities in combination with a guanidine derivative, has the unexpected effect of activating the coupling function alkoxysilane polysulphides, that is, ie to further increase the efficiency of the latter. Through this activation. may in particular be considered to significantly reduce the amount of alkoxysilane polysulphides usually used. This is particularly advantageous because these alkoxysilanes are very expensive and also have the other be used in a large amount, on the order of two to three times the amount of γ- mercaptopropyltrialkoxysilanes necessary to achieve levels equivalent coupling properties; these well-known disadvantages have been described for example in patents US-5,652,310, US Patent 5,684,171, US-A-5 684 172. Thus, the overall cost of the rubber compositions can be significantly lowered, and that of the tires containing them. Accordingly, a first subject of the invention relates to a rubber composition usable for manufacturing tires, comprising at least (i) one diene elastomer, (ii) a white filler as reinforcing filler, (iii) a polysulphurised alkoxysilane as coupling agent (white filler / diene elastomer) with which are associated (iv) a zinc dithiophosphate and (v) a guanidine derivative. The invention also relates to the use of a rubber composition according to the invention for the manufacture of rubber products, especially tires or semi-finished products intended for such tires, these semi-finished products being selected in particular from the group consisting of treads, underlayers intended for example to be positioned beneath these treads, crown plies, sidewalls, carcass plies, beads, protectors, Bs air or airtight internal rubbers for tubeless tires. The invention relates more particularly to the use of such a rubber composition for the manufacture of the sidewalls or tire treads, due to its good hysteresis properties. The invention also relates to a method for preparing a composition according to the invention, this method being characterized by incorporating by mixing at least (i) one diene elastomer, at least (ii) one white filler as reinforcing filler, (iii) a polysulphurised alkoxysilane as coupling agent (white filler / diene elastomer), (iv) a zinc dithiophosphate and (v) a guanidine derivative. The composition according to the invention is particularly suitable for the manufacture of tire treads intended for equipping passenger vehicles, 4x4 vehicles, vans, motorcycles and trucks, airplanes, construction vehicles, agricultural or handling these treads can be used in the manufacture of new tires or the recapping of worn tires. The invention also relates to these tires and these semi-finished rubber products themselves, especially treads, comprising a rubber composition according to the invention. The invention also relates, in itself, a coupling system (white / diene elastomer) for a diene rubber composition reinforced with a white filler, usable for the manufacture of tires, said system being constituted by the combination of a polysulphurised alkoxysilane, a zinc dithiophosphate and a guanidine derivative. The invention also relates to the use of such a coupling system (white filler / diene elastomer) in a rubber composition for tire. The invention secondly relates to the use in combination of a zinc dithiophosphate and a guanidine derivative in the rubber compositions reinforced with a white filler usable for the manufacture of tires, for activating the function coupling (white filler / diene elastomer) of alkoxysilane polysulphides. 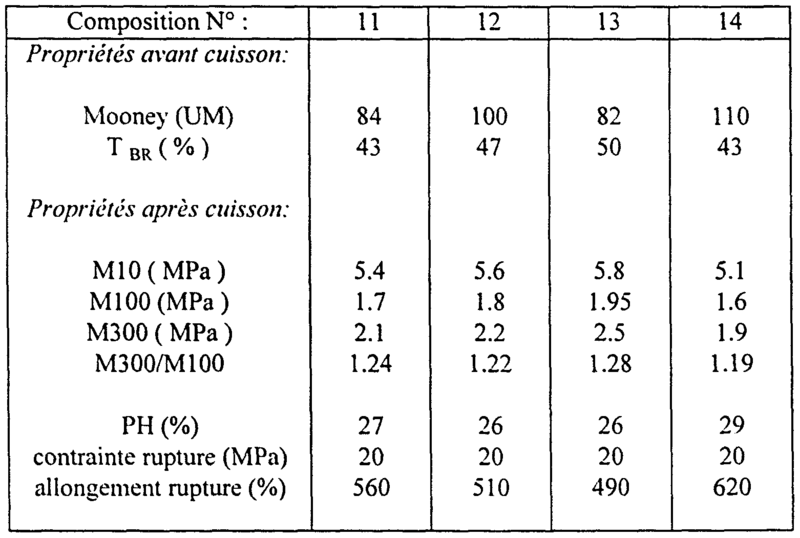 The rubber compositions are characterized before and after curing, as indicated below. An oscillating consistometer as described in the standard AFNOR NFT-43005 (November 1980). The Mooney plasticity is measured in accordance with the following principle: the composition in the uncured state (ie before curing) is molded in a cylindrical enclosure heated to 100 ° C. After one minute preheating, the rotor turns within the test sample at 2 revolutions / minute and measuring the torque used for maintaining this movement after 4 minutes of rotation. The Mooney plasticity is expressed in "Mooney unit" (MU, with 1 MU = 0.83 Newton meters). These tests determine the elasticity stresses and the properties at break. Unless indicated otherwise, they are carried out in accordance with standard AFNOR-NFT-46002 of September 1988. It is measured in a second elongation (ie after an accommodation cycle) the nominal secant moduli (in MPa) at 10% elongation (M 10), 100% elongation (M 100) and 300% elongation (M300). We also measured the tensile strength (in MPa) and elongations at break (in%). All these tensile measurements are carried out under normal temperature and humidity in accordance with standard AFNOR-NFT-40101 (December 1979). Processing the tensile data recorded also allows to trace the function of the elongation modulus curve (see attached figure), the module used here being the true secant modulus measured in a first elongation, calculated reduced to the real section of the specimen and not to the initial section as previously for the nominal modules. with W Q: provided energy; Wi: energy restored. The test called "bound rubber" used to determine the proportion of elastomer in an unvulcanized composition, which is associated with the reinforcing filler so intimately that the proportion of elastomer is insoluble in common organic solvents. Knowledge of this insoluble proportion of rubber attached by the reinforcing filler during mixing, provides a quantitative indication of the reinforcing activity of the filler in the rubber composition. Such a method has been described for example in the standard NFT 45114 (June 1989) applied to the determination of the elastomer bound to the carbon black. This test, well known to the art for characterizing the quality of reinforcement provided by the reinforcing filler, for example, was described in the following documents: Plastics, Rubber and Composites Processing and Applications, Vol. 25, No. 7, p. 327 (1996); Rubber Chemistry and Technology, Vol. 69, p. 325 (1996). In this case, one measures the non-extractable elastomeric rate with toluene, after swelling for 15 days of a rubber composition sample (typically 300-350 mg) in this solvent (e.g., in 80-100 cm 3 of toluene), followed by a drying step of 24 hours at 100 ° C under vacuum, before weighing of the rubber composition sample so treated. Preferably, the swelling step above is carried out at room temperature (about 20 ° C) and protected from light, and the solvent (toluene) is changed once, for example after the first five days swelling. The amount of "bound rubber" (% by weight) - abbreviated as "T BR" - is calculated in a known manner by the difference between the initial weight and the final weight of the rubber composition sample, taking into account and elimination , in the calculation of the fraction insoluble by nature components, other than the elastomer, originally present in the rubber composition. In addition to the usual additives or may be used in a diene rubber composition crosslinkable with sulfur and intended particularly for the manufacture of tires, the rubber compositions according to the invention comprise, as basic constituents, (i) at least one diene elastomer, (ii) at least a white filler as reinforcing filler, (iii) at least one polysulphide alkoxysilane as coupling agent (white filler / diene elastomer) which are associated, to enable the coupling (iv ) at least one zinc dithiophosphate and (v) at least one guanidine derivative. The coupling system according to the invention is in turn consisting of an alkoxysilane polysulfide coupling agent, preferably in a majority (over 50% by weight), and a coupling activator formed by the association of a dithiophosphate zinc and a guanidine derivative. Elastomer or rubber "diene" is meant in a known manner, an elastomer resulting at least in part (ie a homopolymer or a copolymer) from diene monomers (monomers bearing two double carbon-carbon bonds, whether conjugated or not). In general, herein is meant by diene elastomer "essentially unsaturated" a diene elastomer resulting at least in part from conjugated diene monomers, having a content of units or units of diene origin (conjugated dienes) which is greater than 15% (% mol). Thus, for example, diene elastomers such as butyl rubbers or copolymers of dienes and of alpha-olefins of the EPDM type do not fall within the preceding definition, and may in particular be described diene elastomers "essentially saturated "(original reasons for low or very low diene, always less than 15%). In the category of diene elastomers "essentially unsaturated" is meant in particular a diene elastomer "highly unsaturated" diene elastomer having an original units of diene (conjugated dienes) which is greater than 50%. (B) - any copolymer obtained by copolymerization of one or more dienes conjugated together or with one or more vinyl aromatic compounds having 8 to 20 carbon atoms; (C) - a ternary copolymer obtained by copolymerizing ethylene, an α-olefin having 3 to 6 carbon atoms with a nonconjugated diene monomer having from 6 to 12 carbon atoms, such as the elastomers obtained from ethylene and propylene with a nonconjugated diene monomer of the aforementioned type such as in particular 1,4-hexadiene, ethylidene norbornene or dicyclopentadiene; (D) - a copolymer of isobutene and isoprene (butyl rubber) and the halogenated, in particular chlorinated or brominated, to this type of copolymer. Although it applies to any type of diene elastomer, those skilled in the tire art that the present invention, especially when the rubber composition is intended for a tire tread, is used first and foremost out with essentially unsaturated diene elastomers, in particular of type (a) or (b) above. As Suitable conjugated dienes include 1,3-butadiene, 2-methyl-l, 3- butadiene, 2,3-di (Cl-C5 alkyl) -l, 3-butadienes such as, for example 2 , 3-dimethyl-1,3-butadiene. 2,3-diethyl-l, 3-butadiene, 2-methyl-3-ethyl-l, 3-butadiene, 2-methyl-3-isopropyl-1,3-butadiene ary 1-1, 3-butadiene , 1, 3-pentadiene, 2,4-hexadiene. As a vinyl-aromatic compounds are, for example, styrene, ortho-, meta- and para-methylstyrene, the commercial mixture "vinyltoluene", para-tert-butylstyrene, methoxystyrenes, chlorostyrenes, vinylmesitylene, divinylbenzene , vinylnaphthalene. The copolymers may contain between 99% and 20% by weight of diene units and between 1% and 80% by weight of vinyl aromatic units. The elastomers may have any microstructure, which depends on the polymerization conditions used, in particular the presence or absence of an agent modifying and / or randomizing agent and the quantities of modifying and / or randomizing agent used. The elastomers may for example be block, statistical, sequenced or microsequenced, and be prepared in dispersion or in solution; they may be coupled and / or starred or alternatively functionalized with a coupling agent and / or starring or functionalizing. Preferred are polybutadienes and in particular those having a 1,2 content of between 4% and 80% or those having a cis-1,4 content greater than 80%, polyisoprenes, butadiene copolymers styrene and in particular those having a styrene content of between 5% and 50% by weight and more particularly between 20% and 40%, a 1,2-bond content of the butadiene part of between 4% and 65%, a bond content of trans-1,4 between 20% and 80%, butadiene-isoprene copolymers and in particular those having an isoprene content of between 5% and 90% by weight and a glass transition temperature (Tg) of - 40 ° C to -80 ° C, isoprene-styrene copolymers and in particular those having a styrene content of between 5% and 50%> by weight and a Tg of between -25 ° C and -50 ° C.
In the case of butadiene-styrene-isoprene copolymers, those having a styrene content of between 5% and 50% by weight and more particularly between 10% and 40%, an isoprene content of between 15% and 60% by weight and more particularly between 20% and 50%, a butadiene content of between 5% and 50% by weight and more particularly between 20% and 40%, a 1,2 content of the butadiene part of between 4% and 85%, a trans 1,4 content units of the butadiene part of between 6% and 80%, a 1,2- plus 3,4 unit content of the isoprene part of between 5% and 70 % and a trans-1,4 unit content of the isoprene part of between 10% and 50%, and more generally any butadiene-styrene-isoprene copolymer having a Tg of between -20 ° C and -70 ° C.
Particularly preferably, the diene elastomer of the composition according to the invention is selected from the group of highly unsaturated diene elastomers which consists of polybutadienes (BR), polyisoprenes (IR) or natural rubber (NR), copolymers styrene butadiene (SBR), butadiene-isoprene copolymers (BIR), isoprene-styrene copolymers (SIR), butadiene-styrene-isoprene copolymers (SBIR) or a mixture of two or more thereof . The composition according to the invention is preferably intended for a tread for tire. In such a case, the diene elastomer is preferably a copolymer of butadiene-styrene used optionally in mixture with a polybutadiene; more preferably, the diene elastomer is an SBR prepared in solution having a styrene content of between 20% and 30% by weight, a vinyl bond content of the butadiene part of between 15% and 65%, a bond content trans-1,4 between 15% and 75% "and a Tg of between -20 ° C and -55 ° C, SBR copolymer possibly being used in mixture with a polybutadiene having preferably more than 90% cis bonds 1.4. Of course, the compositions of the invention may contain a single diene elastomer or a mixture of several diene elastomers, the diene elastomer may be used in association with any type of synthetic elastomer other than a diene elastomer, or even with polymers other than elastomers, for example thermoplastic polymers. The white filler (sometimes also called "clear" filler) used as reinforcing filler may constitute all or only part of the total reinforcing filler, in the latter case associated, for example carbon black. Preferably, in the rubber compositions according to the invention, the reinforcing white filler constitutes the majority, ie more than 50% by weight of the total reinforcing filler, more preferably more than 80% by weight of the total reinforcing filler. In the present application, the term white filler "reinforcing" white filler capable of reinforcing alone, without any other means than an intermediate coupling agent, a rubber composition intended for the manufacture of tires, in other words capable of replacing in its reinforcing function a conventional filler carbon black. Preferably, the reinforcing white filler is a mineral filler of the type silica (SiO 2) or alumina (Al2O3), or a mixture of these two fillers. The silica used may be any reinforcing silica known to the skilled person, in particular any precipitated or pyrogenic silica having a BET surface area and a specific CTAB surface area both less than 450 m 2 / g, even if the highly dispersible precipitated silicas are preferred, in particular when the invention is implemented to manufacture tires having a low rolling resistance. Highly dispersible silica is any silica having a very substantial ability to disagglomerate and to disperse in an elastomeric matrix, observable in known manner by electron or optical microscopy on thin sections. Non-limiting examples of such preferred highly dispersible silicas include the silica Perkasil KS 430 from Akzo, the silicas BV3380 and Ultrasil 7000 from Degussa, the silicas Zeosil 1165 MP and 1115 MP from Rhodia, silica Hi-Sil 2000 from PPG, silicas Zeopol 8715, 8741 or 8745 from Huber, and treated precipitated silicas such as, for example, the silicas "doped" with aluminum described in EP-A-0735088 . If a reinforcing alumina is used, this is preferably a highly dispersible alumina as described in EP-a-0,810,258 supra, for example the aluminas A125 or IRC 25 (Baikowski), APA-100RDX (Condea), Aluminoxid C (Degussa) or AKP-G015 (Sumitomo Chemical). The physical state in which the reinforcing white filler is immaterial, whether it be in the form of powder, microbeads, granules or alternatively balls. Of course it also means reinforcing white filler mixtures of different reinforcing white fillers, in particular of highly dispersible silicas such as described above. The reinforcing white filler may also be used in a blend (mixture) with carbon black. As carbon blacks all carbon blacks, in particular the blacks of the type HAF, ISAF, SAF, conventional LEMENT used in tires and particularly in treads of tires. As non-limiting examples of such blacks include NI 15 black, N134, N234, N339, N347, N375. The amount of carbon black present in the total reinforcing filler may vary within wide limits, this quantity preferably being less than the quantity of reinforcing white filler present in the rubber composition. Preferably, the total reinforcing filler (reinforcing white filler plus carbon black if appropriate) is within a range from 20 to 300 phr, more preferably from 30 to 150 phr, even more preferably from 50 to 130 phr (parts by weight per hundred of elastomer), the optimum being different depending on the nature of the white reinforcing filler used and the intended applications: the expected level of reinforcement of a bicycle tire, for example, is known to significantly lower way than that required for a tire capable of traveling at high speed in a sustained manner, for example a motorcycle tire, a tire for a passenger vehicle or utility vehicle such as a heavy weight. The coupling agent used in the rubber compositions according to the invention is an alkoxysilane polysulfide, carrying in known manner of two types of functions denoted by "Y" and "X". grafted on the one hand to the white filler by means of the "Y" function (alkoxysilyl function) and on the other hand to the elastomer by means of the "X" function (sulfur function). The polysulfurized alkoxysilanes are widely known to those skilled in the art as coupling agents (white filler / diene elastomer) in rubber compositions for manufacturing tires; reference is made in particular to US-A-3842 January 11, US-A-3 873 489. US-A-3,978,103, US-A-3997581 already mentioned, or the more recent US-A- patents 5580 919. US Patent 5,583,245, US Patent 5,663,396, US Patent 5,684,171, US Patent 5,684,172, US Patent 5,696,197 which detail such compounds known. - the radicals R 1, substituted or unsubstituted, identical or different, represent an alkyl group C r C I8 cycloalkyl, C 5 -C lg or C 6 -C 18; - the radicals R 2, substituted or unsubstituted, identical or different, represent an alkoxyl group C r -C 18 cycloalkoxy or C 5 -Cι 8. In formula (I) above, the number n is preferably an integer from 2 to 5. In the case of a mixture of alkoxysilane polysulphides corresponding to the formula (I) above, in particular conventional commercially available mixtures, the average value of "n" is a fractional number, preferably between 3 and 5, more preferably close to 4. However, the invention can also be advantageously implemented for example with disulphide alkoxysilanes (n = 2). The radical A, substituted or unsubstituted, is preferably a divalent hydrocarbon radical, saturated or unsaturated, having 1 to 18 carbon atoms. Particularly suitable alkylene groups Cι-C, g, or arylene groups, C 6 -C 12, especially alkylenes C | -C, 0, in particular C 2 -C 4, particularly propylene. The radicals R 1 are preferably alkyl C r -C 6 alkyl, cyclohexyl or phenyl. especially alkyl groups C r C 4, more particularly methyl and / or ethyl. The R 2 radicals are preferably alkoxyl groups, C, -C 8 cycloalkoxy or C 5 -C 8, more particularly methoxy and / or ethoxy. Such alkoxysilane polysulphides called "symmetrical" and some of their processes for the production are described for example in the recent US-A-5684171 and US Patent 5,684,172 giving a detailed list of these known compounds, for n ranging from 2 to 8. Preferably, the polysulphurised alkoxysilane used in the invention is a polysulphide, in particular a disulfide or tetrasulfide, bis (alkoxyl (C] -C4) silylpropyl), more preferably bis (trialkoxy (C j -C 4) silylpropyl) include bis (3-triethoxysilylpropyl) or bis (3-trimethoxysilylpropyl). For example, disulfide, bis (triethoxysilylpropyl) TESPD or of the formula [^ 2 ^ 0) 3 Si (CH 2) 3 S] 2, is marketed for example by Degussa under the Si266 or Si75 (in the second case in the form of a mixture of disulphide (75 wt%) and polysulfide), or by the company Witco under the name Silquest Al 589. the tetrasulfide, bis (triethoxysilylpropyl) or TESPT, of the formula [ (C 2 H 5 O) 3 Si (CH2) 3 S 2] 2, is marketed for example by the company Degussa under the name Si69 (or X50S when it is supported for example by the company Degussa under the name Si69 (or X50S when is supported at 50% by weight on carbon black), or by the company Witco under the trade name Silquest a 1289 (in both cases polysulphides commercial mixture with an average value of n which is close to 4). most preferably is used TESPT. However, one advantageous embodiment of the invention is to use the TESPD, although less active than TESPT when used alone, but whose effectiveness is significantly improved by the presence of zinc dithiophosphate and guanidine derivative. In the rubber compositions according to the invention, the alkoxysilane polysulphide content may be within a range of 0.5 to 15% relative to the weight of reinforcing white filler, but it is generally desirable to use as little possible. The presence of zinc dithiophosphate and of guanidine derivative in these compositions advantageously allows to use the polysulphurised alkoxysilane at a lower preferential rate to 8%, more preferably still less than 6% relative to the weight of reinforcing white filler; rates of between 3% and 6% are possible eg. Of course, the polysulphurised alkoxysilane could be grafted (via the "X" function) onto the diene elastomer of the composition of the invention, the elastomer thus functionalized or "precoupled" comprises the "Y" function for the white reinforcing filler. The alkoxysilane polysulfide may also be grafted (via the "Y" function) on the reinforcing white filler, the filler thus "precoupled" can then be bonded to the diene elastomer by means of the free function "X". However, it is preferred, in particular for reasons of better use of the compositions in the uncured state, to use the coupling agent is grafted onto the reinforcing white filler, either in the free state (ie, non-grafted) as the dithiophosphate zinc and the guanidine derivative which are associated therewith in the coupling system according to the invention. The coupling system according to the invention consists of the alkoxysilane polysulfide coupling agent defined above and a coupling activator for this alkoxysilane. By "activator" coupling, it is meant herein a body (a compound or combination of compounds) which, when mixed with a coupling agent, increases the effectiveness of the latter. The coupling enhancer used in accordance with the invention is formed by the combination of a zinc dithiophosphate and a guanidine derivative. formula known in which the radicals R 3, identical or different, represent hydrogen or a monovalent hydrocarbon group. Preferably, this monovalent hydrocarbon group comprising 1 to 18 carbon atoms. More preferably, the radicals R 3 are alkyl or cycloalkyl groups, linear or branched, substituted or unsubstituted, having from 1 to 12 carbon atoms, especially alkyl groups, C 2 -C 8 cycloalkyl or C 5 -C 12 . Among these preferred alkyl groups are in particular ethyl, propyl, isopropyl, butyl, isobutyl, cyclohexyl, more particularly alkyl C 3 -C.
DTPZn was essentially known so far as a lubricating additive in the field of metallurgy (see e.g. GB-A-1066576, EP-A-15 824, EP-A-769 545, US-A-5716 913. WO96 / 37581), or as an ultra-accelerator of vulcanization in substantially saturated rubbers of the EPDM compositions intended for example for conveyor belts, hoses or curing membranes (see e.g. FR-A- 1556085 EP-A-692 518 or CA-A-2153509), or even, more rarely, in diene rubber compositions for tires (see eg Chemical Abstracts vol 89, No. 26, abstract No. 216568 ( 25.12.78); Chemical Abstracts vol 114, no 6, abstract No. 44671 (01/02/91 1): application JP 1998/151906; EP-A-0832920). It was found, surprisingly, that a dithiophosphate in small amounts, combined with a guanidine derivative. carries, in the rubber compositions of the invention reinforced with a white filler, a function very advantageous vis-à-vis coupling activator polysulfurized alkoxysilanes. This result is particularly unexpected for the skilled person that the known properties of ultra-accelerator DTPZn rather were a component in a priori incompatible with essentially unsaturated diene elastomers used in rubber compositions for the manufacture of tires, mainly because of grid problems ( "scorching") described above. Examples of DTPZn, are for example zinc dialkyldithiophosphates sold by Rhein-Chemie (Germany) under the names Rhenocure TP / G and TP / S (mixtures of di-isopropyl- and di-isobutyl dithiophosphate) the product marketed by Monsanto under the name Vocol S (dibutyldithiophosphate), or those described in patent applications EP-A-692 518 or CA-A-2153509 cited above. The skilled artisan will adjust the optimum content of DTPZn depending on the intended application, the diene elastomer selected, the amount of reinforcing white filler, the polysulphurised alkoxysilane and of guanidine derivative used in a range of preferably between 0.25 and 3 phr, more preferably between 0.5 and 1.5 phr; rates of between 0.5 and 1 phr are advantageously possible. Of course, the optimum content DTPZn will be chosen in the first place, depending on the amount of alkoxysilane polysulfide used. Preferably, in the coupling system according to the invention, the amount of DTPZn represents between 5% and 60% compared to the weight of polysulphurised alkoxysilane. Below the indicated minimum rate, the effect risks being inadequate, whereas beyond the maximum rate indicated generally no further improvement is observed the coupling while the costs of the composition and increase the risk one the other being exposed to the risks of mesh mentioned above. For these reasons, the amount of zinc dithiophosphate represents more preferably between 10% and 40% compared to the weight of polysulphurised alkoxysilane. On the other hand, in the rubber compositions according to the invention, the total quantity of polysulphurised alkoxysilane and of zinc dithiophosphate is preferably less than 10%, more preferably less than 8% relative to the weight of reinforcing white filler; more preferably, this amount may be between 4% and 8% relative to the weight of reinforcing white filler. The second component necessary for the activation of the coupling is a guanidine derivative, it is-to-say a substituted guanidine. Substituted guanidines are well known in the art, especially as vulcanizing agents, and have been described in numerous documents (see for example "Vulcanization and vulcanizing agents" by W. Hofmann, Ed. MacLaren and Sons Ltd. ( London), 1967, pp 180-182;. EP-A-0683203 or US-A-5,569,721). wherein Ar and Ar represents an aryl group, substituted or unsubstituted, preferably phenyl, and R represents hydrogen or a hydrocarbon group. Examples of compounds of formula (IV-2) above, mention may be made, besides the already mentioned DPG, triphenylguanidine or di-o- tolylguanidine. In the compositions according to the invention, the quantity of guanidine derivative is preferably between 0.5% and 4%, more preferably between 1% and 3%, relative to the weight of reinforcing white filler, or preferably between 0, 4 and 25 phr, more preferably between 0.5 and 2 phr. Below the minimum indicated the effect of activation risks being inadequate, whereas beyond the maxima indicated generally no further improvement is observed the coupling, while exposing themselves to roasting risks. Preferably, in the compositions according to the invention, the coupling system of the rates according to the invention, consisting of alkoxysilane polysulfide coupling agent and the coupling activator (zinc dithiophosphate + guanidine derivative) represents between 2 % and 20% relative to the weight of reinforcing white filler, more preferably between 5% and 15%. In most cases, the coupling system according to the invention has proved powerful enough for the needs of the rubber compositions according to the invention for the manufacture of tires, for a rate below 12% the weight of reinforcing white filler, or even less than 10%. Levels of between 5% and 10% are for example advantageously possible in rubber compositions for tire treads for passenger vehicles. Relative to the weight of elastomer (s) diene (s) present (s) in rubber compositions according to the invention, the coupling system of the rates according to the invention is preferably between 1 and 10 phr, more preferably between 4 and 8 phr. Of course, the rubber compositions according to the invention also comprise all or part of the additives usually used in diene rubber compositions crosslinkable with sulfur and intended for the manufacture of tires, such as plasticizers, pigments, agents to protection of the type antioxidants, antiozonants, a crosslinking system based either on sulfur or sulfur donors and or peroxide and or bismaleimides, vulcanization accelerators, vulcanization activators, extender oils, etc .. At the reinforcing white filler may also be associated, if necessary, a conventional reinforcing white filler, such as particles of clay, bentonite, talc, chalk, kaolin, titanium oxides. The compositions according to the invention may also contain, in addition polysulfurized alkoxysilanes, covering agents (comprising for example the single function Y) of the reinforcing white filler, or more generally processing aids in the implementation may known manner, by improving the dispersion of the white filler in the rubber matrix and to a lowering of the viscosity of the compositions, to improve their ability to be used in the uncured state, these agents being, for example alkylalkoxysilanes (in particular alkyltriethoxysilanes), polyols, polyethers (e.g., polyethylene glycols), primary, secondary or tertiary amines, hydroxylated or hydrolysable polyorganosiloxanes, for example α, ω- dihydroxy-polyorganosiloxanes (in particular α, ω- dihydroxy-polydimethylsiloxanes). These compositions may contain, in addition, coupling agents other than alkoxysilane polysulphides. The compositions are produced in suitable mixers, using two successive preparation phases according to a well known procedure to those skilled in the art: a first phase of thermomechanical working or mechanical mixing (sometimes referred to as phase "non-productive") to high temperature, up to a maximum temperature of between 130 ° C and 200 ° C, preferably between 145 ° C and 185 ° C, followed by a second phase of mechanical working (sometimes referred to as "productive" phase) to over low temperature, typically below 120 ° C, for example between 60 ° C and 100 ° C, finishing phase in which is incorporated the crosslinking or vulcanization system; such phases have been described for example in EP-A-0501227 supra. According to a preferred embodiment of the invention, all the base constituents of the compositions according to the invention, namely (ii) the reinforcing white filler and the coupling system according to the invention consists of the combination of (iii ) the polysulphurised alkoxysilane, of (iv) zinc dithiophosphate and (v) the guanidine derivative, are incorporated in (i) the diene elastomer during the first non-productive phase called, that is to say is introduced into the mixer and are kneaded thermomechanically, in one or more steps, at least these different base constituents until a maximum temperature between 130 ° C and 200 ° C, preferably between 145 ° C and 185 ° C.
For example, the first (non-productive) is carried out in a single thermomechanical step during which is introduced in a suitable mixer such as a conventional internal mixer, all the necessary components including the coupling system according to the invention, any covering agents or additional implementation and various other additives, with the exception of the vulcanization system. A second stage of thermomechanical working may be added, in this internal mixer, for example after an intermediate cooling step (preferably at a temperature below 100 ° C), for the purpose of subjecting the compositions to an additional heat treatment, in particular to further improve the dispersion in the elastomeric matrix to the reinforcing white filler and its coupling system. After cooling the mixture thus obtained is then incorporated at low temperature vulcanization system, generally in an external mixer such as a roll mill; the whole is then mixed (productive phase) for several minutes, for example between 5 and 15 minutes. The final composition thus obtained is then calendered, for example in the form of a sheet, a plate or a rubber profile usable for the manufacture of semi-finished such as treads. The vulcanization (or curing) is carried out in known manner at a temperature generally between 130 ° C and 200 ° C for a sufficient time which may vary for example between 5 and 90 minutes depending on the curing temperature, the system vulcanization adopted and the vulcanization kinetics of the composition. It goes without saying that the invention relates to the rubber compositions previously described, both in the uncured state (ie before curing) and in the cured state (ie after crosslinking or vulcanization). Of course, the compositions according to the invention can be used alone or in a blend with any other rubber composition usable for manufacturing tires. One proceeds to the following tests as follows: there is introduced into an internal mixer, filled to 70% and an initial chamber temperature was about 60 ° C, successively the reinforcing filler, the coupling system according to the invention, the diene elastomer or the mixture of diene elastomers, and various other ingredients, except the vulcanization system. Is then performed thermomechanical working (non-productive phase) in one step, which lasts about 3 to 4 minutes, until a maximum temperature "dropping" of 165 ° C.
Recovering the thus obtained mixture, cooled and then incorporates sulfur and sulfenamide in known manner, in an external mixer (homo-finisher) at 30 ° C, mixing the (productive phase) for a suitable time, ranging from 5 and 12 minutes depending on the case. The compositions thus obtained are subsequently calendered, either in the form of plates (thickness of 2 to 3 mm) or thin sheets of rubber for the measurement of their physical or mechanical properties, or in the form of usable profiles directly after cutting and / or assembling to the desired dimensions, for example as semi-finished products for tires, in particular as treads. In the following tests, the reinforcing white filler (highly dispersible silica) constitutes the entire reinforcing filler, but it goes without saying that a fraction of the latter, preferably a minority, could be replaced by carbon black. five rubber compositions are compared (SBR elastomer) reinforced with silica for the manufacture of tires or treads for tires. The SBR elastomer (styrene-butadiene) is prepared in solution, and comprises 25%) of styrene, 58% of 1-2 polybutadiene units and 22% 1,4-trans polybutadiene units. - Composition No. 5: no coupling agent, DTPZn alone (1 phr). Each composition further comprises 1.5 phr of guanidine derivative (3% relative to the weight of reinforcing white filler). therefore only the composition No. 4 is according to the invention; Composition No. l is the base composition devoid of coupling agent, while Composition No. 2 represents the reference of the prior art. 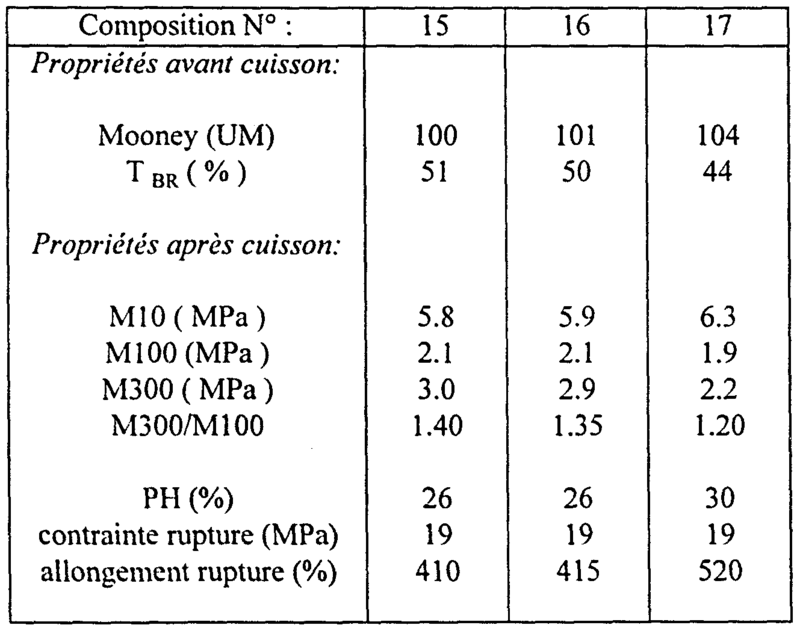 Tables 1 and 2 show in succession the formulation of the different compositions (Table 1 - rate of the different products expressed in phr), and their properties before and after curing (150 ° C, 40 minutes). Figure 1 shows in turn the curves of modulus (in MPa) as function of the elongation (in%); these curves are marked Cl to C5 and correspond to rubber compositions No. l to No. 5. - the equivalent properties at break. 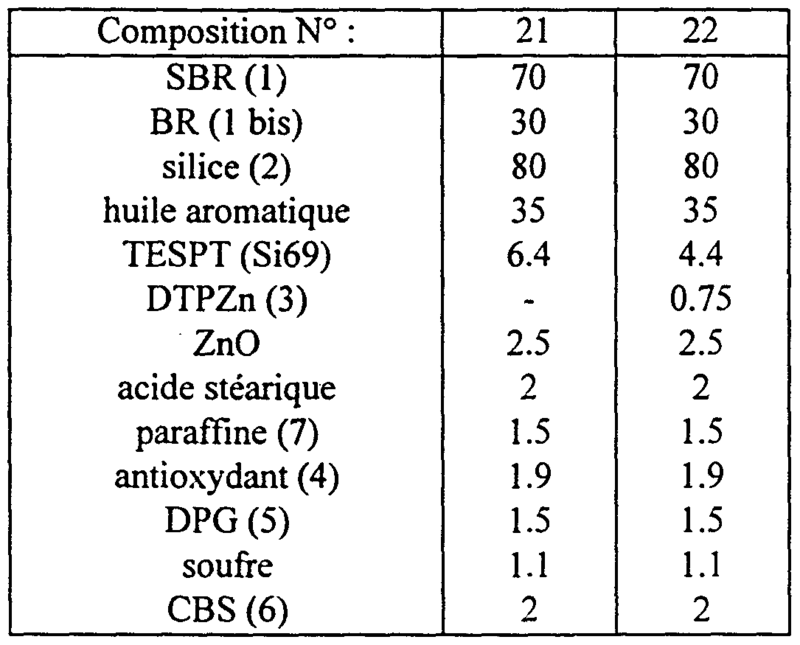 A comparison of the results obtained between the composition # 2 and # 3 compositions (TESPT rate reduced to 2.8 phr, but without DTPZn) on the one hand, No. 5 (DTPZn and DPG alone without coupling agent) on the other hand, also by demonstrating the synergistic effect obtained between the polysulphurised alkoxysilane, the zinc dithiophosphate and the guanidine derivative: TESPT, in the presence of DPG, shows, for a rate of 2.8 phr, insufficient performance (compare composition # 3 with compositions No. I and No. 2), while the DTPZn and the guanidine derivative used alone, without a coupling agent, have no binding effect between the elastomer and the reinforcing white filler ( compare compositions No. 5 and No. l) and do not alter the properties of the composition No. base. Only the combination of the three products (TESPT + DTPZn + DPG) allows to obtain the desired technical effect. Figure 1 attached confirms the previous observations. The values ​​of modulus, for elongations of 100%) and are highest on the composition # 4 (curve C4) according to the invention, greater than those observed on the composition of reference # 2 (curve C2); about the curves Cl, C3 and C5, are located well below; for such a range of elongations, this behavior illustrates a better interaction between the reinforcing filler and the elastomer. in other words a maximum reinforcing effect, thanks to the invention of the coupling system. Three rubber compositions (mixture of SBR and BR elastomers) reinforced with silica also for the manufacture of tires or treads for tires. - Composition No. 8: TESPT (3.2 phr) with which there is associated DTPZn (0.75 phr, or 23.4% based on the weight of TESPT); Each composition further comprises 1.5 phr of guanidine derivative (about 1.9% relative to the weight of reinforcing white filler). Composition No. 6 is the control for this test, it contains an amount of TESPT of 8% relative to the weight of reinforcing white filler (6.4 phr of TESPT per 80 phr of silica). Compositions No. 7 and No. 8, in accordance with the invention contain on the other hand an amount of TESPT significantly lower than that of Composition No. 6, in both cases less than 6% compared to the white filler weight reinforcing (5.6% and 4% respectively). Tables 3 and 4 show the formulation of the different compositions and their properties before and after curing (150 ° C, 40 minutes). For compositions according to the invention No. 7 and No. 8, the quantity (TESPT + DTPZn) is respectively 6.6% and 4.9% relative to the weight of reinforcing white filler, and therefore remains advantageously less than the 8% used for TESPT alone in the composition of the prior art. The rate of coupling system itself, formed by the association of the polysulphurised alkoxysilane, of zinc dithiophosphate and of guanidine derivative, it preferably represents less than 10% (particularly 8.4%) for the composition No. 7, and less than 8% (precisely, 6.8%) for the composition No. 8, relative to the weight of reinforcing white filler. Examining the results of Table 4 shows that Composition No. 7 compared to the control composition No. 6, combines the advantages of an improved processing (reduced viscosity in the uncured state), and a level of improved reinforcement (T BR, M100, M300, M300 / M100 ratio higher); fracture properties are equivalent, and 5 hysteresis slightly better properties. As for Composition No. 8, compared with the control Composition No. 6, note that the properties measured after cooking are strictly equivalent to those of the control composition which however has twice TESPT. Of course, the viscosity at the uncured state 0 is increased, but if necessary, this can be easily corrected by the skilled person for example by adding a processing aid such as a plasticizer or a covering agent for the reinforcing white filler, during the manufacture of the composition. Comparing here two natural rubber compositions reinforced with silica, usable for the manufacture of tires or semi-finished products for tires such as treads. - Composition No. 10: TESPT (4.5 phr) with which there is associated DTPZn (0.75 phr, or 16.7% based on the weight of TESPT). 5 Each composition further comprises 1.5 phr of guanidine derivative. Composition No. 10 is according to the invention, while Composition No. 9 is the control for this test. Tables 5 and 6 show the formulation of the different compositions and their properties before and after curing (150 ° C, 40 minutes). As in previous tests, the amount of TESPT, expressed in% relative to the weight of reinforcing white filler, is greatly reduced between the control composition # 9 and the composition of the invention No. 10: one pass through the effect of 8 % (6.4 phr of TESPT per 80 phr of silica) 5.6% (4.5 phr of TESPT). Advantageously, it is noted that the total quantity of polysulphurised alkoxysilane and DTPZn (4.5 + 0.75 = 5.25 phr) represents less than 8% (exactly 6.6%) and the coupling system rate itself (TESPT + DTPZn DPG +) less than 10% (particularly 8.4%) relative to the weight of reinforcing white filler (80 phr) in the composition according to the invention. 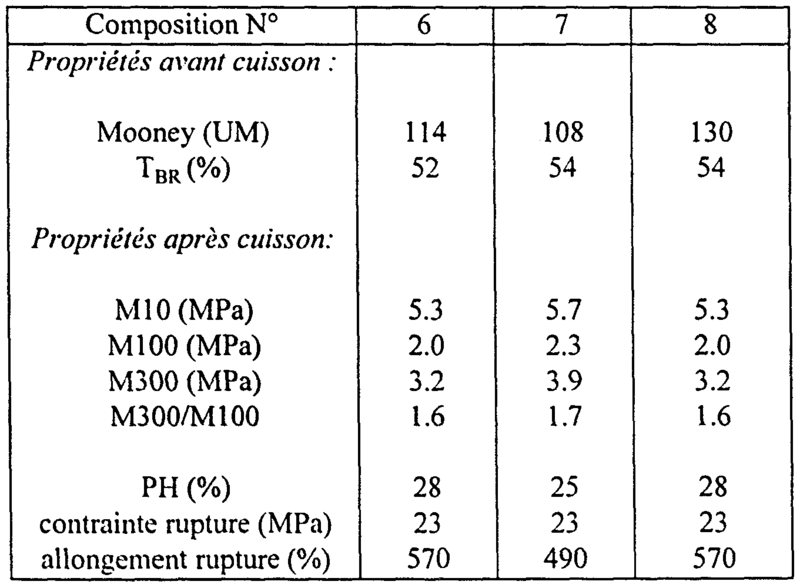 Despite this very significant decrease in the amount of TESPT, it is noted once again that the composition according to the invention has properties at least equal if not superior to those of the control composition (see Table 6) viscosity equivalent or slightly more low in the uncured state; reinforcement properties at least equal to or greater (M 100 values and substantially identical M300, M300 / M100 ratio higher T BR higher); better hysteresis (slightly lower PH); and finally equivalent properties at break. This test demonstrates that the presence of a guanidine derivative is an essential feature in the coupling system according to the invention. - Composition No. 14: TESPT (4.5 phr) with DTPZn (0.75 phr) but without guanidine derivative. Composition No. II is the control for this test and contains 8% by weight of alkoxysilane polysulfide based on the weight of reinforcing white filler, which is already previously indicated as a relatively low rate compared with conventional rates. Despite this, the amount of coupling agent has been reduced, in the compositions according to the invention No. 12 and No. 13. 30% compared to the control composition. 5.6%), the quantity (TESPT + DTPZn) represents less than 8% (precisely, 6.6%), and the amount of the coupling system itself (TESPT + DTPZn + DPG) represents less than 10% ( exactly 8.4% composition No. 13), or even less than 8% (precisely, 7.5% composition No. 12), these% being calculated relative to the weight of reinforcing white filler. The study shows that different results Compositions No. 12 and No. 13 according to the invention, compared with the control Composition No. II, present in the uncured state a Mooney viscosity equal or greater but still satisfactory, a rate of "bound rubber" top, and in the cured state properties at least equal if not superior see modulus values ​​M 100 and M300, M300 / M100 ratio PH and losses; all this illustrates a coupling (white filler / diene elastomer) of high quality in the compositions according to the invention, despite a rate of polysulphurised alkoxysilane considerably lower. A similar rate of guanidine derivative (1.5 phr), the composition according to the invention # 13 turns out even significantly better (see rate of "bound rubber", M 100 values, M300, M300 / M100, PH losses ) as the control composition No. ll which nevertheless contains a polysulphurized alkoxysilane rate higher by more than 40%. As for Composition No. 14, devoid of guanidine derivative, it is noted that these properties are degraded compared with those of the compositions of the invention # 12 and # 13, both in the uncured state and after curing (viscosity higher. lower T BR, greater losses HL, lower level of reinforcement from the values Ml 00, M300 and M300 / M100), despite an identical rate (4.5 units) of TESPT coupling agent and the presence of dithiophosphate. Clearly, in the absence of guanidine derivative, zinc dithiophosphate has no activation effect on the coupling agent. This test shows that it is preferable, during the manufacture of the compositions of the invention, incorporating the guanidine derivative to the elastomer with the reinforcing white filler and the rest of the coupling system (polysulphurised alkoxysilane and of zinc dithiophosphate ) during the first phase of thermomechanical working (non-productive phase), not later with the vulcanization system (productive phase). Is prepared for this three rubber compositions according to the invention, strictly identical formulations comprising including 4.5 phr of TESPT, 1 phr of DTPZn (22% approximately relative to the weight of alkoxysilane) and 1.5 phr of guanidine derivative. 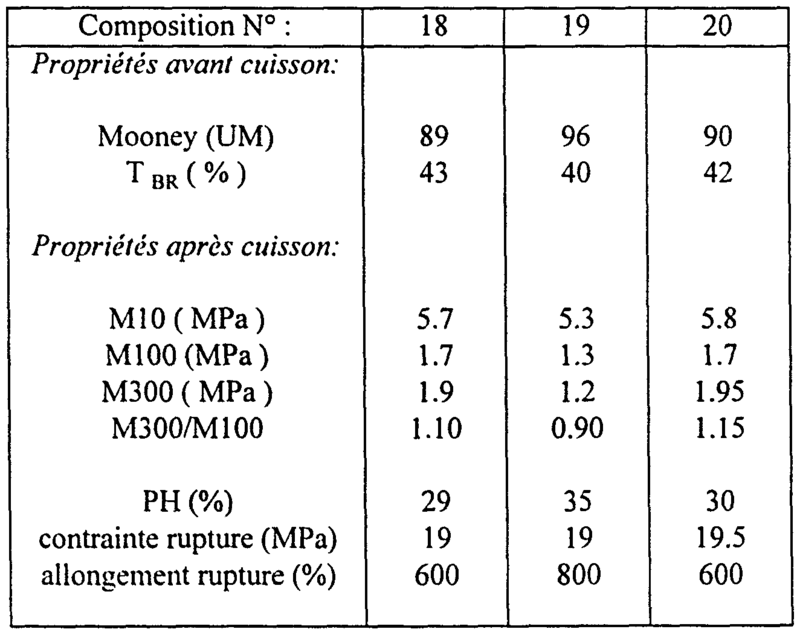 Tables 9 and 10 show the formulation of the different compositions and their properties before and after curing (150 ° C, 40 minutes). In those compositions according to the invention, it is noted that the quantity of polysulphurised alkoxysilane represents advantageously less than 6% (exactly 5.6%), the quantity (TESPT + DTPZn) less than 8% (exactly 6.9%) and 10 coupling system itself (TESPT + DTPZn DPG +) less than 10% (particularly 8.8%), relative to the weight of reinforcing white filler. The study of the different results shows that the performance is good in all cases, particularly for a rate as low TESPT, compositions No. 15 and No. 16 by having 15 also almost identical properties, both state believed in the cured state. Compared with composition No. 17, the Compositions No. 15 and No. 16 are also substantially improved properties: a rate of "bound rubber" upper, lower losses HL, M modulus values ​​100 and M300 and reporting M300 / M100 also 20 superior. These results illustrate a coupling (white filler / diene elastomer) best when the guanidine derivative is incorporated in the elastomer along with other components (polysulphurised alkoxysilane and of zinc dithiophosphate) of the coupling system according to the invention, c ' is to say during said manufacturing phase "non-productive". This test demonstrates that it is possible, thanks to the activation provided by the zinc dithiophosphate and the guanidine derivative, to replace an alkoxysilane tetrasulfide (TESPT) with a 30 alkoxysilane disulfide (TESPD), known as less active than the previous one, without penalizing significantly the other rubber compositions properties. - Composition No. 20: TESPD (5.6 phr) activated by 0.75 phr of zinc dithiophosphate (13.4% o by weight of TESPD) and 1, 5 phr of guanidine derivative. 45 of its surface hydroxyl groups. Composition No. 20 is the only composition according to the invention; relative to the weight of silica (80 phr), it comprises less than 8% (precisely 7%) of polysulphurised alkoxysilane, less than 8% (particularly 7.9%) of polysulphurised alkoxysilane and of zinc dithiophosphate, finally less 10% (particularly 9.8%) of coupling system according to the invention consists of the combination of polysulphurised alkoxysilane, of zinc dithiophosphate and of guanidine derivative. Tables 11 and 12 give foπnulation different compositions and their properties before and after curing (150 ° C, 40 minutes); Figure 2 reproduces the curves of modulus (in MPa) as function of the elongation (in%), these curves being marked Cl 8 to C20 and corresponding to Compositions # 18 to # 20. It is noted that the composition No. 19, compared with the control Composition No. 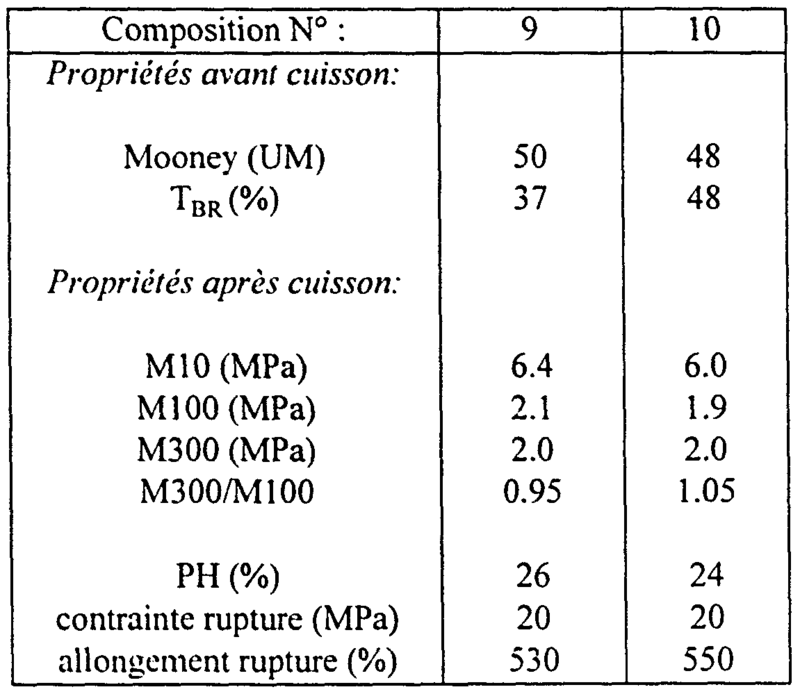 18, after firing has reinforcement properties (M100, M300 and M300 / M100) which are very much lower and hysteresis greater losses; a decrease in performance is also recorded before firing (increased viscosity, fall 15 the rate of "bound rubber"); all this is due, in known manner, to the lower coupling efficiency (white filler / diene elastomer) of the alkoxysilane disulfide (TESPD) with respect to the alkoxysilane tetrasulfide (TESPT). "> S curves in Figure 2 (curves C20 and Cl 8 virtually overlapping, both located, in particular for 100% higher elongations), well beyond the Cl 9 curve). 30 The invention is illustrated here by a radial carcass tire running tests of dimension 175/70 RI 4, manufactured in a known manner and are identical in every respect except for the constitution of the rubber composition constituting the tread which is given in table 13. 35 The reinforcing white filler is a highly dispersible silica. Based on the weight of the white filler, the coupling (white filler / diene elastomer) is ensured by 8% TESPT in the control composition # 21, by less than 6% (exactly 5.5%) only of TESPT in the composition according to the invention N ° 22, a reduction of about 30%, "the amount of polysulfide alkoxysilane coupling agent. In the tread of the tire according to the invention, the 5.5% TESPT are activated by a very small amount of zinc dithiophosphate (0.75 phr, or 17% relative to the weight of alkoxysilane) in combination with 1.5 phr of guanidine derivative. The amount of alkoxysilane and of zinc dithiophosphate represents less than 8% 45 (exactly 6.4%) relative to the weight of reinforcing white filler. The rate of coupling system according to the invention (TESPT + DTPZn + DPG), it represents itself advantageously less than 10% (particularly 8.3%) relative to the weight of reinforcing white filler. Subjecting the tires thus prepared to an on-road travel on a brand passenger vehicle Citroen Xantia until the wear due to running reaches the wear indicators located in the grooves of the tread. Manner known to those skilled in the art, the wear resistance of the rubber composition during the rolling of the tire, is directly correlated to the quality of the reinforcement provided by the reinforcing filler, that is to say the coupling ratio (filler / elastomer) obtained. In other words, the extent of the wear resistance is an excellent indicator, if not the best, as evaluated on the final manufactured product, the performance of the coupling system used. Is observed after the rolling tire whose tread is according to the invention shows a performance at least equal to or very slightly greater than that of the control tire (gain of about 1% in wear resistance determined on the tire the invention) without adversely affecting the other performance driving. This equivalent wear resistance, despite a coupling agent rate greatly reduced, could be obtained only through the strong activation of the coupling provided by the zinc dithiophosphate and the guanidine derivative in combination. In conclusion, as demonstrated by various tests above, the novel coupling system (white filler / diene elastomer) of the invention, formed by the association of a polysulphurised alkoxysilane, a zinc dithiophosphate and a guanidine derivative, provides a balance of properties particularly advantageous compositions of the invention, compared with compositions reinforced with a white filler of the prior art. In this new coupling system, the zinc dithiophosphate and the guanidine derivative used in combination, as an activator of coupling, allow in particular to reduce very significantly the polysulfurized alkoxysilanes rate usually used in rubber compositions for tires reinforced with a white filler. The invention thus reduces the cost of the rubber compositions, and therefore that of tires made from such compositions. (L) to (6) same as Table 1; (7) Melanee of macro- and microcrystalline waxes antiozonant. 1. A rubber composition usable for manufacturing tires, comprising at least (i) a di├⌐nique ├⌐lastom├¿re, (ii) a white filler as ├á renfor├ºante filler, (iii) an alkoxysilane polysulfur├⌐ ├á as coupling agent (white filler / ├⌐lastom├¿re di├⌐nique) which are associ├⌐s (iv) a zinc dithiophosphate and (v) a d├⌐riv├⌐ guanidine. 2. A rubber composition according to claim 1, wherein the guanidine is d├⌐riv├⌐ diph├⌐nylguanidme. 3. A rubber composition according to any one of claims 1 or 2, wherein the alkoxysilane is a polysulfur├⌐ polysulfur├⌐ bis-alkoxyl (C, -C 4) silylpropyl. 4. A rubber composition according to claim 3, wherein the polysulfur├⌐ alkoxysilane is bis-3-t├⌐trasulfure tri├⌐thoxysilylpropyle. 5. A rubber composition according to claim 3, wherein the alkoxysilane is polysulfur├⌐ disulfide, bis 3-tri├⌐thoxysilylpropyle. 6. A rubber composition according to any one of claims 1 ├á 5, wherein the alkoxysilane quantit├⌐ polysulfur├⌐ repr├⌐sente less than 8% by weight of white filler renfor├ºante. 7. A rubber composition according to claim 6, wherein the alkoxysilane quantit├⌐ polysulfur├⌐ repr├⌐sente less than 6% by weight of white filler renfor├ºante. 8. The rubber composition according to any one of claims 1 ├á 7, wherein the zinc dithiophosphate is an alkyl (C t -C 12) alkyl dithiophosphate. 9. A rubber composition according to any one of claims 1 ├á 8, wherein the quantit├⌐ repr├⌐sente of zinc dithiophosphate 5% to 60% by weight of alkoxysilane polysulfur├⌐. 10. A rubber composition according to claim 9, wherein the zinc dithiophosphate quantit├⌐ repr├⌐sente between 10% and 40% by weight of alkoxysilane polysulfur├⌐. 11. 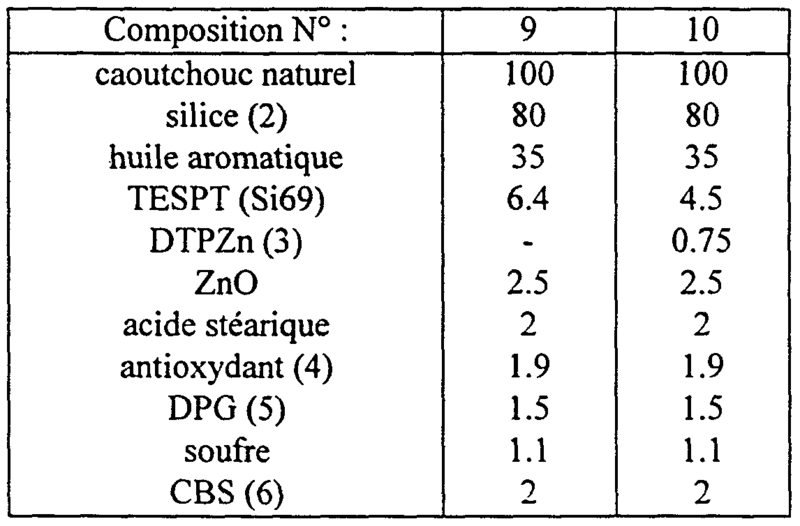 A rubber composition according to any one of claims 1 ├á 10, wherein the total quantit├⌐ polysulfur├⌐ alkoxysilane and of zinc dithiophosphate repr├⌐sente less than 10% relative to the white filler weight renfor├ºante. 12. 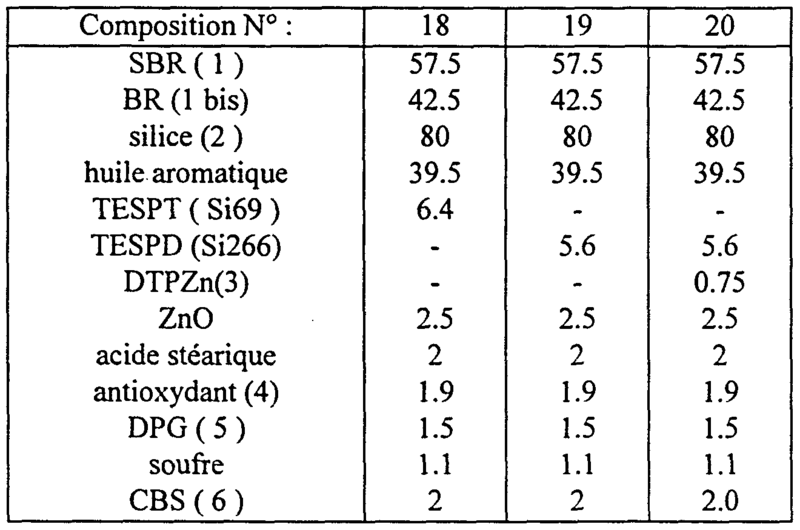 A rubber composition according to claim 11, wherein the total quantit├⌐ polysulfur├⌐ alkoxysilane and of zinc dithiophosphate repr├⌐sente between 4% and 8% by weight of white filler renfor├ºante. 13. 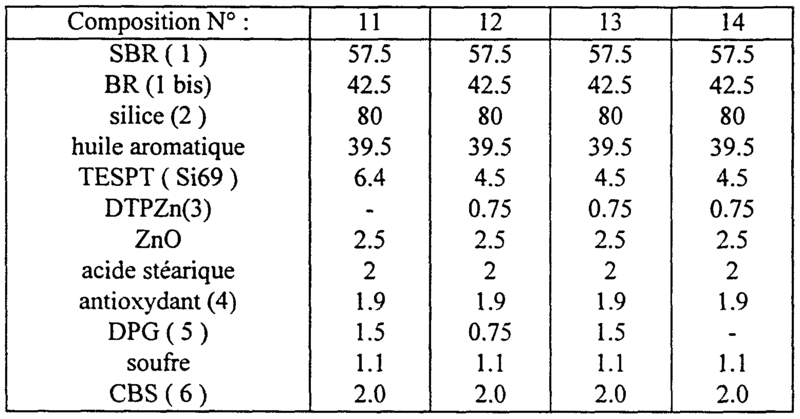 A rubber composition according to any one of claims 1 ├á 12, wherein the guanidine repr├⌐sente d├⌐riv├⌐ quantit├⌐ of between 0.5 and 4% by weight of white filler STRENGTHENING ├ºante. 14. A rubber composition according to any one of claims 1 ├á 13, wherein the total quantit├⌐ polysulfur├⌐ alkoxysilane, of zinc dithiophosphate and of guanidine d├⌐riv├⌐ repr├⌐sente between 2 % and 20% by weight of white filler renfor├ºante. 15. 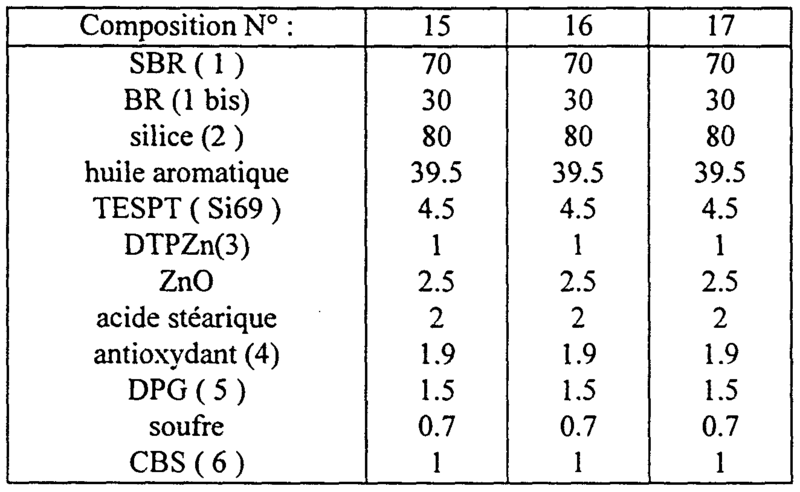 A rubber composition according to claim 14, wherein the total quantit├⌐ polysulfur├⌐ alkoxysilane, of zinc dithiophosphate and of guanidine d├⌐riv├⌐ repr├⌐sente between 5% and 15% compared to renfor├ºante weight of white filler. 16. A rubber composition according to claim 15, wherein the total quantit├⌐ polysulfur├⌐ alkoxysilane, of zinc dithiophosphate and of guanidine d├⌐riv├⌐ repr├⌐sente less than 12% by weight of renfor├ºante white filler. 17. A rubber composition according to claim 16, wherein the total quantit├⌐ alkoxysilane polysulfur├⌐. of zinc dithiophosphate and of guanidine d├⌐riv├⌐ repr├⌐sente less than 10% by weight of white filler renfor├ºante. 18. A rubber composition according to any one of claims 1 ├á 17, wherein the renfor├ºante white filler is majoritarily silica. 19. A rubber composition according to any one of claims 1 ├á 18, wherein the white filler constitutes the renfor├ºante totalit├⌐ of renfor├ºante load. 20. A rubber composition according to any one of claims 1 ├á 18, wherein the white filler is renfor├ºante utilis├⌐e in m├⌐lange with carbon black. 21. A rubber composition according to any one of claims 1 ├á 20, wherein the ├⌐lastom├¿re di├⌐nique is selected from the group constitu├⌐ by polybutadi├¿nes, the polyisopr├¿ nes or natural rubber, copolym├¿res of butadi├¿ne-styr├¿ne, the copolym├¿res of butadi├¿ne-isopr├¿ne, the copolym├¿res of isopr├¿ne- styr├¿ne the copolym├¿res of butadi├¿ne-styr├¿ne-isopr├¿ne, or m├⌐lange of two or more of these compos├⌐s. 22. A rubber composition according to claim 21, wherein the ├⌐lastom├¿re di├⌐nique is a copolym├¿re of butadi├¿ne-styr├¿ne ├⌐ventuellement utilis├⌐ in m├⌐ lange with polybutadi├¿ne. 23. A rubber composition according to claim 22, wherein the ├⌐lastom├¿re di├⌐nique is a copolym├¿re of butadi├¿ne-styr├¿ne pr├⌐par├⌐ solution having a styr├¿ne content between 20% and 30% by weight, a vinyl bond content of the butadi├⌐nique part of between 15% and 65%, a trans-1,4 bond content of between 20% and 75%) and a glass transition temp├⌐rature between -20┬░C and -55┬░C, this copolym├¿re of butadi├¿ne-styr├¿ne ├⌐tant ├⌐ventuellement utilis├⌐ in m├⌐lange with poss├⌐dant polybutadi├¿ne pr├⌐f├⌐rence of more than 90%) of cis-1,4 bonds. 24. Proc├⌐d├⌐ pr├⌐parer for a rubber composition according to any one of claims 1 ├á 23 caract├⌐ris├⌐ by incorporating ├á by kneading at least (i) a di├⌐nique ├⌐lastom├¿re, at least (ii) a white filler as ├á renfor├ºante filler, (iii) a polysulfur├⌐ ├á alkoxysilane as coupling agent (white filler / ├ ⌐lastom├¿re di├⌐nique), (iv) a zinc dithiophosphate and (v) a guanidine d├⌐riv├⌐. 25. Proc├⌐d├⌐ according to claim 24, caract├⌐ris├⌐ in that, in one or more ├⌐tapes, ├á is incorporated (i) ├⌐lastom├¿re di├⌐nique , at least (ii) a white filler renfor├ºante, (iii) polysulfur├⌐ alkoxysilane, (iv) the zinc dithiophosphate and (v) the guanidine d├⌐riv├⌐, and kneaded in that thermom├⌐caniquement all jusqu'├á achieve maximum temp├⌐rature between 130┬░C and 200┬░C. 26. Proc├⌐d├⌐ according to claim 25, caract├⌐ris├⌐ in that the maximum kneading temp├⌐rature is between 145┬░C and 180┬░C. 27. Use of a rubber composition according ├á to any one of claims 1 ├á 23 for the manufacture of tires or semi-finished rubber products destin├⌐s to tires, these semi-finished products ├⌐ as selected from the group constitu├⌐ by the treads, underlayers for these treads, crown plies, sidewalls, carcass plies, beads, protectors, inner tubes or ├á int gums ├⌐rieures ├⌐tanches for tubeless tires. 28. A tire comprising a rubber composition according ├á to any one of claims 1 ├á 23. 29. A semi-finished rubber product for tires, comprising a rubber composition according ├á to any one of claims 1 ├á 23, this semi-finished product ├⌐tant in particular selected from the group constitu├⌐ bands rolling, the sublayers of these treads, crown plies, sidewalls, carcass plies, beads, protectors, inner tubes or ├á int├⌐rieures ├⌐tanches rubbers for tubeless tires. 30. Semifinished product according to claim 29, consisting of a tread. 31. The tread according to claim 30, in that it is caract├⌐ris├⌐e ├á based on a rubber composition according to any one of claims 21 ├á 23. 32. Syst├¿me coupling (white filler / ├⌐lastom├¿re di├⌐nique) for a rubber composition based ├á ├⌐lastom├¿re di├⌐nique renforc├⌐e by a white filler usable for manufacturing tires, caract├⌐ris├⌐ in that constitu├⌐ by the combination of a polysulfur├⌐ alkoxysilane, a zinc dithiophosphate and a d├⌐riv├ ⌐ guanidine. 33. Syst├¿me coupling according to claim 32, wherein the alkoxysilane polysulfur├⌐ repr├⌐sente more than 50% by weight of the coupling syst├¿me. 34. Syst├¿me coupling according to claims 32 or 33, wherein the guanidine is d├⌐riv├⌐ diph├⌐nylguanidine. 35. Syst├¿me coupling according to any one of claims 32 ├á 34, wherein the alkoxysilane is a polysulfur├⌐ polysulfur├⌐ bis-alkoxyl (Cj-C, 4) silylpropyl. 36. Syst├¿me coupling according to claim 35, wherein the polysulfur├⌐ alkoxysilane is bis-3-t├⌐trasulfure tri├⌐thoxysilylpropyle. 37. Syst├¿me coupling according to claim 35, wherein the alkoxysilane is polysulfur├⌐ disulfide, bis 3-tri├⌐thoxysilylpropyle. 38. Syst├¿me coupling according to any one of claims 32 ├á 37, wherein the zinc dithiophosphate is an alkyl (C] -C I2) dithiophosphate. 39. Use of a coupling syst├¿me according to any one of claims 32 ├á 38, for coupling a white filler and a renfor├ºante ├⌐lastom├¿re di├⌐nique in a rubber composition usable for manufacturing tires. 40. Use in combination of a zinc dithiophosphate and a guanidine d├⌐riv├⌐, in a rubber composition renforc├⌐e with a white filler usable for the manufacture of tires, to activate the coupling function (white filler / ├⌐lastom├¿re di├⌐nique) a polysulfur├⌐ alkoxysilane. 41. Use according to claim 40, wherein the alkoxysilane is a polysulfur├⌐ polysulfur├⌐ bis-alkoxyl (C j -C 4) silylpropyl. 42. Use according to claim 41, wherein the polysulfur├⌐ alkoxysilane is bis-3-t├⌐trasulfure tri├⌐thoxysilylpropyle. 43. Use according to claim 41, wherein the alkoxysilane is polysulfur├⌐ disulfide, bis 3-tri├⌐thoxysilylpropyle. 44. Use according to any one of claims 40 ├á 43, wherein the zinc dithiophosphate is an alkyl (C, -C 12) dithio╧ühosphate zinc. 45. Use according to any one of claims 40 ├á 44, caract├⌐ris├⌐e in that the guanidine d├⌐riv├⌐ is diph├⌐nylguanidine. 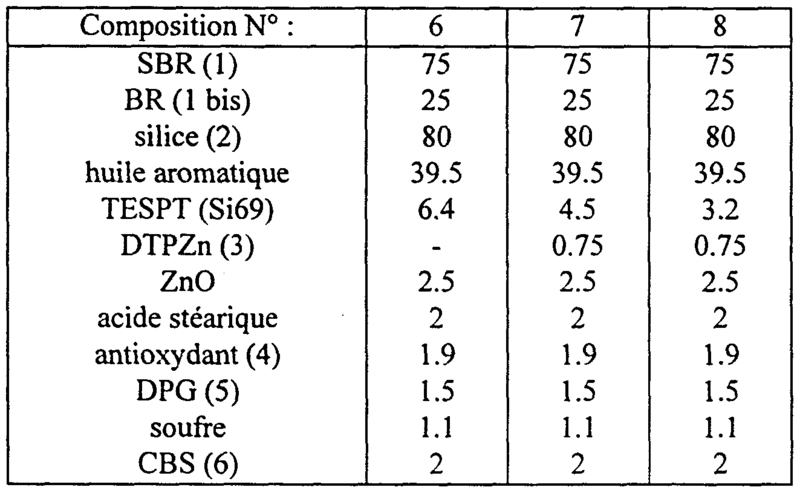 BR9912343A BR9912343A (en) 1998-07-22 1999-07-20 rubber composition, a process for preparing a rubber composition, use of a composition of rubber, of a coupling system and in combination of a zinc dithiophosphate and a derivative guanìdico, pneumatic, semi-finished rubber product for pneumatic , tread and docking system.